A change in national identity may be taking place. Neutrality is no longer the most commonly cited characteristic. Education, research and internationalism define forward-looking, modern Switzerland. A key component of the Worry Barometer is the section that asks questions about Swiss identity. The way Swiss citizens define their country can be seen in, among other things, the three main terms they use to describe Switzerland. The results over the last several years reveal a sharp change in Swiss identity. They have become more heterogeneous, and "traditional" Swiss characteristics, such as neutrality or landscape, have become less important. Turning first to heterogeneity, for the first time no single characteristic was cited by 20 percent or more of respondents. This year's No. 1, the education system, was cited by 13 percent of respondents – a figure that would only have placed it fourth last year. In general, the values this year are clustered more closely around the average and there are fewer extremes. It could also be said that a number of different features characterize Switzerland nowadays. The characteristics that respondents now attribute to Switzerland are interesting. For the first time, the country's good education system occupies the top spot. Although this "Swiss strength" only increased by four percentage points, the education system jumped up by eight places, because many other characteristics were cited less frequently than before. Switzerland is increasingly being defined by its brain power, and research and development (6 percent) are also considered part of its identity. These results fit with Switzerland's position as a high-tech country – one that is occupying the top spot in the Global Innovation Index for the seventh year in a row. In international quality of life rankings, Switzerland and Swiss cities also always achieve ratings of good to very good. 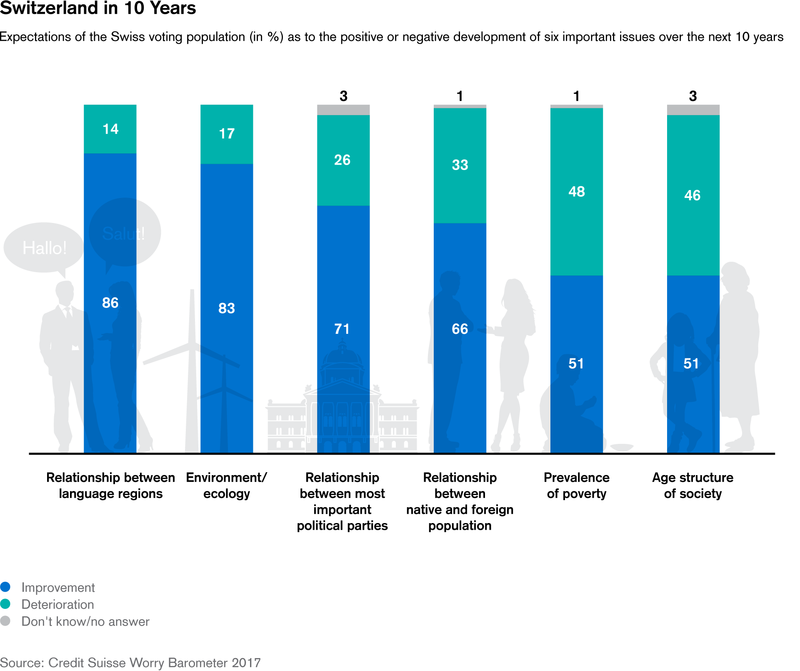 This is also reflected in this year's Worry Barometer results: High quality of life (6 percent) is also on the list of defining characteristics. Another new characteristic that was cited is humanitarian aid (9 percent), which probably made the list in the wake of the refugee crisis that has unfolded on the Mediterranean and in the Balkans in recent years. Another characteristic that moved up was tradition (8 percent), which had dropped off the list in 2016, but which was cited with similar frequency this year as in 2015 (6 percent) and 2014 (5 percent). Just as significant as the new No. 1 are those characteristics that dropped in the rankings, including what one would associate with traditional Swiss identity. "Neutrality" was cited by 32 percent in 2015, 15 percent last year and 11 percent this year. The trajectory for "security" was similar (19 percent, 21 percent, 12 percent). And "landscape" (10 percent) and "home" (6 percent) have steadily declined over the past five years as well. Just under 10 percent of respondents have cited "direct democracy" in recent years – this year it was just 4 percent. This new Swiss identity is also confirmed by those economic aspects that the Swiss are very or somewhat proud of. At the top of the list are 1. international companies domiciled in Switzerland, 2. research, 3. strong Swiss brands abroad, and 4. Switzerland's international reputation for quality. Neutrality has topped the list of political characteristics that people are somewhat or very proud of since 2012, similar to the rankings of the main Swiss characteristics. Not so in 2017: Here, too, there has been a change in identity. Neutrality now ranks fourth, down 17 percentage points from last year. 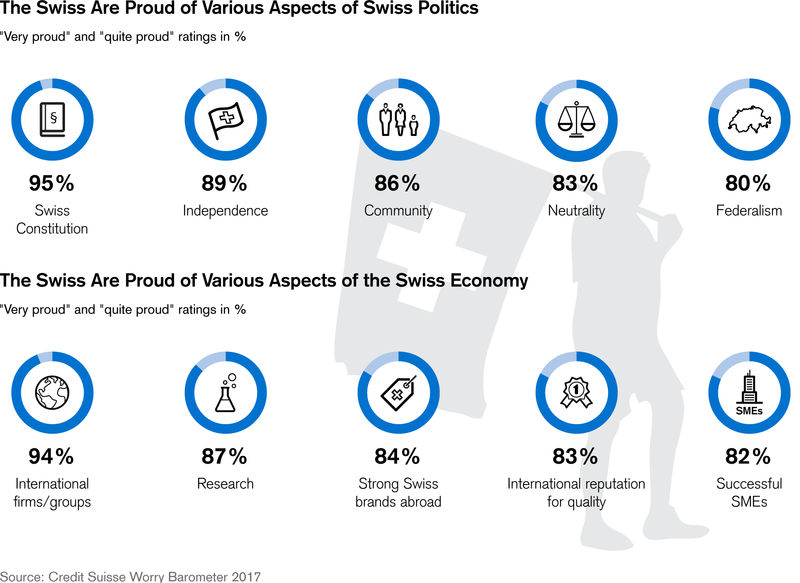 Respondents see other aspects as greater Swiss strengths, with the Federal Constitution at the top, followed by independence, and finally cohesion. Interestingly, if one were to look only at the "very proud of…" responses in both categories (economic aspects and political aspects), the "traditional" characteristics come out on top: successful SMEs (economy) and neutrality (politics). These characteristics still trigger very strong emotions, but only among a relatively small group of respondents. Although Swiss identity has changed, pride in Switzerland has not declined. On the contrary, it has increased steadily in recent years: In 2004, 73 percent of Swiss citizens were proud or very proud of their country, and in 2010 the combined figure was 82 percent; today, it is 90 percent. It seems that this new, forward-looking identity based on education, research and internationalism has a broad foundation – even in political terms. While in the past it was mainly citizens who aligned themselves politically on the right who were proud of Switzerland, there is now virtually no difference among people on the right, center and left in terms of people who agree with this sentiment. Is active Identity: A New Switzerland?